A fracture is a broken bone. A bone may be completely fractured or partially fractures in a number of ways: crosswise, lengthwise, or in multiple pieces. Weight-bearing exercises help keep bones strong, such as walking, hiking, dancing, aerobics, and tennis. Resistance training with free weights strengthens major muscle groups. Flexibility and balance exercises like tai chi and yoga improve balance and help to avoid falls. Consult with the DOC physical therapist or an athletic trainer to create a personalized bone building diet and exercise program. The DOC orthopedic surgeon or PA will carefully examine the injured area and confirm the diagnosis with X-rays, which provide clear images of bone. 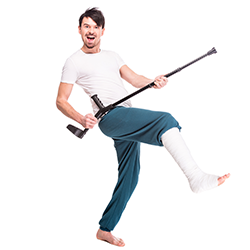 A plaster or fiberglass cast is the most common type of fracture treatment. Most broken bones heal successfully once they have been repositioned and a cast keeps the broken ends in the proper position to heal.